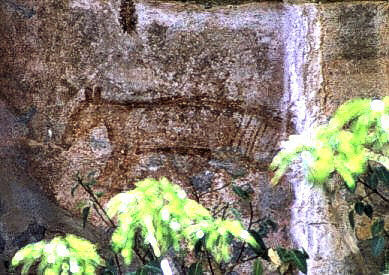 One of the few places to see a thylacine for sure: on a rock near Ubirr. If you're clueless what kind of animal I'm talking of: Ever heard about the Tasman Tiger? It's officially extinct - killed by white settlers - since some 80 years, but in 2002 many people were still sure it still survives hidden in the Tasmanian forrests. When returning to Tassie 9 years later, the presence of the animal in symbols and minds had clearly decreased, getting replaced by the Tasman Devil, also facing extinction. Long time ago there were a couple of species, but only one experienced the immigration of the Dingo as a human pet - not surviving it for long. Dingos probably came with the second settlement of humans some 2000 years ago and outcompeted the thylacine very soon. Such things do happen and are in fact the way life goes. But the hunting and deforrestation still going on in Tasmania are a different thing. I met a couple of people saying if anyone proved the survival of the Tasman Tiger this would be the final strike to kill them for ever. What times do we live in?